Ever thrown your hands up in frustration because you can't figure out how or where to get started when decorating your home? Don't worry, you're not alone. Many people are confused, perplexed and just plain baffled about colors, patterns, styles and more. With so many options and combinations available, who wouldn 't be? That's why we've summoned the help of two experienced interior designers to give us a little courage for the trip. Here are some of their easy, useful and tasteful tips for creating a beautiful home. Elaine Baker of Elaine S. Baker and Associates, a furniture store and interior design firm in Anchorage, and Linda Amedy, interior designer and owner of Elemental Design in Anchorage, agree that the most common design mistake that they see is bad furniture – too much, wrong-sized or poorly arranged. Whether it is too big for the room, or there is simply too much of it, this problem is easily preventable with a little planning beforehand. For a well-balanced and comfortable room, Baker says "the thing that makes the most difference is a space plan." To create a space plan, a professional designer will measure each room and then draft it to scale using a computer program. This allows homeowners to try out different arrangements, colors and styles before committing to a finished design scheme. And they save money too: "If you plan it out on paper first, then you can purchase more wisely later," Baker comments, adding, "People tend to overbuy instead of planning carefully." Painting an entire room white does not necessarily make it feel larger and lighter, a mistake often seen in Alaskan homes where owners want to maximize light in the winter months. "A lot of people think that white walls will lighten their rooms, but it often has the opposite effect, especially in the winter, with all the white outside and the light coming in makes it look really cold inside," explains Amedy. Another mistake that Amedy notices is "artwork placed way too high – it really needs to be at eye level. Consider the vantage point of how the art is viewed – sometimes eye level is when you are sitting, like in the dining room." Using color in your home can be an intimidating prospect – what if you don't like the same green next year, where should color go and how much is too much? Amedy says that color should be used to accomplish the overall emotional effect intended for a room: "If you want drama, use contrasting colors. For a more airy or open feel you want monochromatics, light colors like creams, whites, tans. And if you're wanting more upbeat, fun and funky, use a neutral color base with bright pops of color like oranges or blues." Using accessories to integrate color is an easy and affordable way to change the look of a room or to experiment with new colors. Amedy says that, "Window treatments can make a huge difference, they can make (a room) look larger, more intimate and bring color. Also, throw pillows bring color to a space." Baker cautions: "If you have a small space, you probably do not want strong contrasting colors," because they will overwhelm, but contrasting colors will work in a larger space. Amedy recommends using "a similar color throughout the house to create unity." For instance, use blue to accent a wall in one room and for the trim in another. When choosing colors, go with what you like, let a favorite object or even a piece of clothing inspire color choices. Color and "furniture tend to follow fashion and we're seeing crisp black and white," says Baker. "What we see in fashion today we will see in home furnishings in a couple of years." Because of the long, dark winters and the midnight sun in the summer, Alaskans face some unique home design challenges. A simple fix for the dark winters is more indoor lighting, says Amedy, "I go into many spaces that have white walls and very little lighting and it looks dingy" instead of appearing light and airy. "I recommend layering your lighting, you have overhead but also use under cabinet lighting for a warm effect." Baker agrees, "One of the biggest problems in Alaska is the lack of lighting in winter. When many homes were built they didn't add enough lighting in rooms to be able to enjoy the winter months." And again, Amedy recommends color to achieve a more open feel: "A misconception is that color will darken, but actually it can make a room look more warm." She recommends golden hues to lighten a room. The summer presents the opposite problem, and "sun control in the bedroom," is an absolute must, says Baker, as well as in the rest of the home. "We have a tremendous amount of sun in the summer and it can damage the fabrics, but it also fades woodwork," she explains. 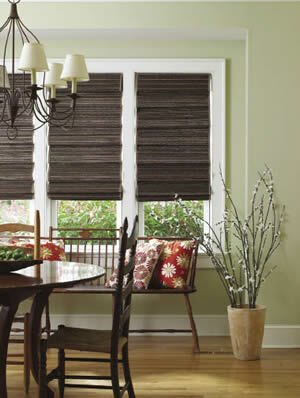 Drawing the shades for a couple hours a day can help to protect wood furniture and upholstery, and blackout shades in the bedroom are a necessity for a good night's sleep. In this same vein, the designers offer some tips on seasonally decorating a home. Baker recommends bringing the outside in by using flower arrangements, "In the summer we want to use fresh, spring cut flowers, tulips and peonies. In the fall we have the mums and the golden colors. For the holiday season there are beautiful arrangements of greens, hollies and live flowers." Amedy suggests easy seasonal alterations to a home's design scheme by "removing heavy draperies at the end of winter and putting up lighter curtains in the summer." In homes with hardwood floors, she recommends removing area rugs in the summer to create an open, clean look. Whether designing a brand new home or redecorating an old one, there is an important rule that homeowners should always keep in mind, says Baker. "I really feel that it's critical for both partners to like what happens in a project, to be comfortable. I don't think there's any sofa or any fabric that warrants disharmony in a relationship." In other words, when the whole family's unique tastes are represented in the design and décor, then a beautifully decorated house becomes a truly harmonious home. Resources: Elemental Design: www.elem-design.com, 907-317-2279; Elaine S. Baker & Associates: www.finefurnishings.net, 907-276-4829.